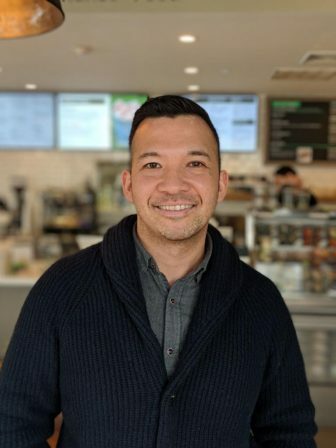 Embody Fitness Gourmet, a purveyor of performance food with cafes in Darien, Westport and New Canaan, announced today that Philip Domino has joined the company as its chief executive officer. Most recently, Mr. Domino was director of operations at Green and Tonic. Previously, he served as director of operations at Momofuku – Fuku in New York. Mr. Domino worked for seven years at Le Pain Quotidien in increasingly responsible positions globally, eventually as district manager for Connecticut and New York. He is a graduate of the Professional Chef Program at the Cambridge School of Culinary Arts, Cambridge, Massachusetts. Mr. Domino is a decorated Marine Corps veteran with campaign medals from Iraq and Afghanistan. “Embody’s dedication to serving locally sourced, gourmet performance food has earned it a loyal customer base and growing demand from the Darien, Westport and New Canaan communities”, said Gillen Bryan, founder of Embody. “I developed tremendous respect for what Gillen achieved at Embody from my previous role as a close competitor,”Domino said. “No one does performance food better than Embody. “Phil is a remarkable example of an American success story,” said Todd Thomson, founding investor in Embody. “He arrived in the US as an immigrant at age 11, learned English, succeeded in school, joined the Marines, became a trained chef, and has made a career with top food brands such as Momofuku and Le Pain Quotidien. He is exactly the type of leader who truly embodies Embody. We welcome Phil as CEO of the team. Founded in 2008, Embody Fitness Gourmet provides local/gourmet/performance food. With fresh smoothies, salads, juices, açaí bowls, hot bowls, and La Colombe coffee, Embody’s low sugar, nutrient dense foods are meant to help optimize physical and mental performance — and taste good, too. Embody is a sponsor for the Darien Junior Football League, Darien Youth Hockey, and Little Leagues in New Canaan, Westport and Darien.